Today in Masonic History Edward Vernon Rickenbacker is born in 1890. Edward Vernon Rickenbacker is an American aviator and businessman. Rickenbacker was born on October 8th, 1890 in Columbus, Ohio. He was born Edward Rickenbacher with no middle name and an "h" instead of a "k" in the spelling of his last name. From a young age, Rickenbacker loved machines and was encouraged by his father's words "A machine has to have a purpose." His father would pass away when Rickenbacker was 13. His father's passing would also end Rickenbacker's formal education, although his love of machines would inspire him to do correspondence courses on engineering and work with a variety of machines. Rickenbacker would become a well known race car driver prior to World War I. He would race at the Indianapolis 500 four times before the War. He would earn the name "Fast Eddie." 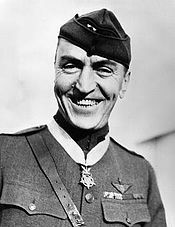 After the start of World War I and before the United States entered the war, Rickenbacker would change his name removing the "h" in "Rickenbacher" to, as he put it, "take the Hun out of his name." He would also make up a middle name. He would first sign autographs with a variety of letters for a middle initial, finally settling on a "V" and eventually creating the middle name Vernon. Rickenbacker would travel to England at the beginning of World War I, eager to be part of the fighting. Although his Swiss heritage made him a concern for British authorities who thought he was a spy. He would be under constant surveillance while in England. He would return to the United States before the official entry of the United States into the War. In 1917, after the United States entered the War, Rickenbacker immediately enlisted and joined soldiers training France. Most men chosen as pilots during World War I had college educations, so Rickenbacker's superiors were reluctant to let him fly. After they discovered his skill with mechanics of the aircraft, they were more reluctant to lose a valuable ground crew member. Eventually he would be allowed to get his wings. He would become an ace almost immediately shooting down 5 enemy aircraft. By the end of the War he would be promoted to Captain and made the commander of his squadron. He would fly more 300 combat hours and shot down 26 enemy aircraft. After the War, Rickenbacker was approached about exploiting his fame. He would decide to do a Liberty bond tour. After the tour he would be released from the military as a Major. He would for the rest of his life refer to himself as a Captain though as he felt that was the rank he earned. In 1920, Rickenbacker started the Rickenbacker Motor Company. He would sell cars that used advanced technology developed for racing cars. He would introduce the first four wheel braking system. By 1927, he was forced to declare bankruptcy due to poor sales. Competitors are blamed by some for the failure, fearing that they would not be able to sell their existing cars, they would engineered a spear campaign about the four wheel braking system. After Rickenbacker's bankruptcy, most cars came with four wheel braking systems. Rickenbacker got into a very public dispute with President Franklin Roosevelt. Rickenbacker felt that the President's policies were nothing more than socialism. In 1934, Roosevelt ordered all mail contracts rescinded. This directly effected the company that Rickenbacker was running, Eastern Air Transport. The Roosevelt administration ordered NBC Radio not to allow Rickenbacker to broadcast opinions critical of Roosevelt's policies. In 1938, Rickenbacker purchased the Eastern Air Transport from General Motors, he was running the company for them at the time. The company would eventually become Eastern Air Lines. Rickenbacker would fly regularly on Eastern Air Lines flights. On February 26th, 1941, he would be in a major crash of one of their planes just outside of Georgia. His injuries were so severe that doctors and emergency crews thought he was dead and it was reported in the media that he had died in the crash. Despite his severe injuries in the crash, he is credited for helping people during the crash keeping their spirits up and telling those that were ambulatory what to do to help others, the whole time being pinned under debris. Rickenbacker would also be involved in the crash of a military aircraft in the South Pacific. It was only by a series of lucky events that the Rickenbacker along with most of the crew of the craft were able to survive. Again, Rickenbacker was reported as deceased in the media. They were adrift at sea for 24 days. Rickenbacker suffered a stroke while in Switzerland seeking a special medical treatment for his wife. He would later get pneumonia and pass away on July 23rd, 1973. Rickenbacker was a member of Kilwinning Lodge No. 297 in Detroit, Michigan.